The centerpiece of the Roots of Freedom education program is the Freedom Gallery. This stunning 23-piece display presents the story of America's founding in a visually stimulating manner. 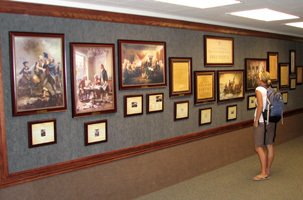 The Freedom Gallery was created to be a beautiful addition to any public or corporate building. Some schools refer to their gallery as the "learning wall" because of the many life lessons which are taught. Watch a video of our Freedom Gallery here. Visit our store to purchase an entire Freedom Gallery or individual pieces. For generic installation guidelines click here. For a diagram of the Freedom Gallery click here. Look at a diagram of our security hanger here. For a look at all of the Freedom Gallery storyboards click here. 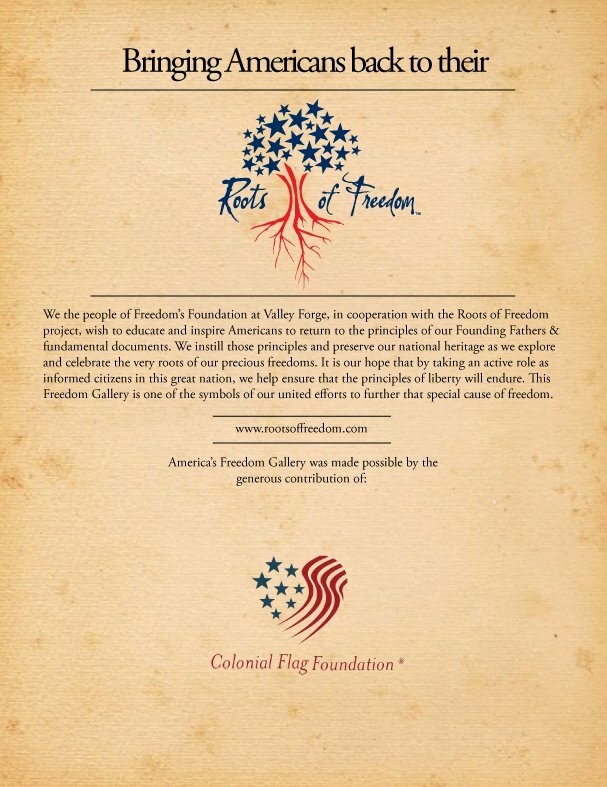 Click here for a Freedom Gallery Flyer! We will make a personalized sponsorship plaque for your Freedom Gallery, just let us know what you want it to say! The sponsorship plaque adds an important element to every Freedom Gallery. Click HERE to see a sample! This image can either be framed or set in a plaque. Go to our store to purchase this product. If you think the gallery is too hard to install, check out our Installation Guide which offers inspiration and tips. Although your location needs will be different, much of the same ideas will apply. You can do it yourself! At many schools putting the Freedom Gallery up becomes a community event. Now you can read, download and print all of the Freedom Gallery storyboards in color and black and white right HERE!